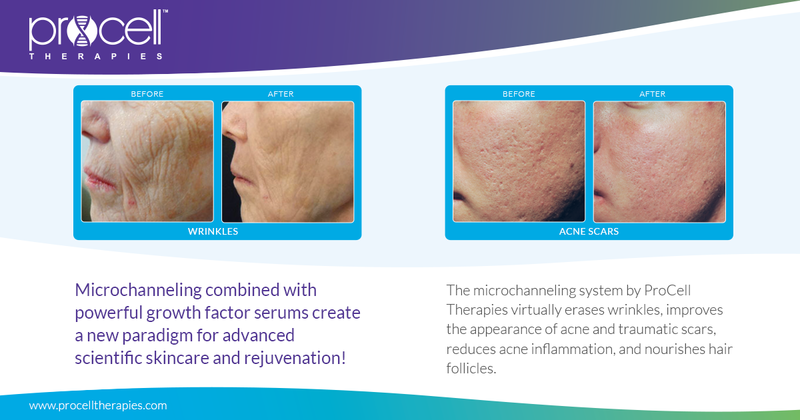 Microchanneling is collagen stimulation by microchannel delivery of peptides, growth factors & cytokines. A tiny array of micro-filaments is is gently applied to create thousands of stimulating microchannels in your skin. It rejuvenates with little to no recovery time, and produces both corrective and anti-aging benefits. It's a favorite from Hollywood to New York, and provides skin rejuvenation that you see! 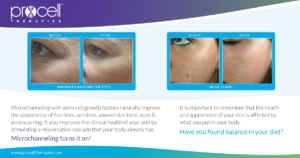 Procell improves the appearance of aging skin, increases the vitality of your skin, and reduces the appearance of fine lines, wrinkles, uneven skin tone, acne & acne scarring. It also improves the clinical health of your skin by stimulating a rejuvenation cascade that your body has built in, just waiting to be activated! In the past microneedling technologies (like the pens and rollers) relied on creating damage to the skin in order to trigger tissue repair via your body's powerful wound healing ability. 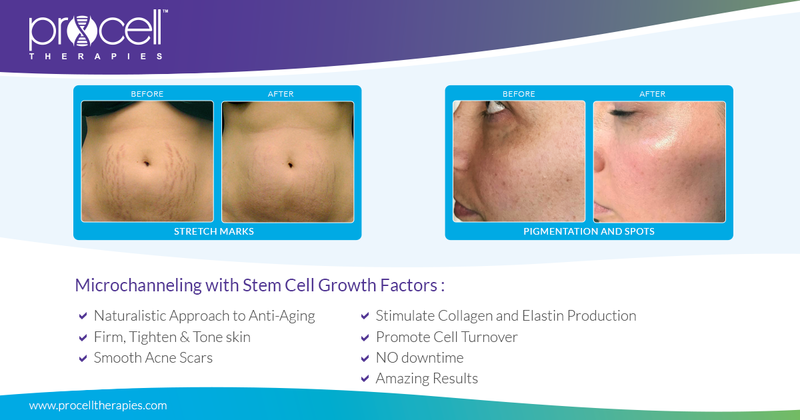 Procell stimulates a more effective rejuvenation with less damage to skin, and more stimulation of stem cells. 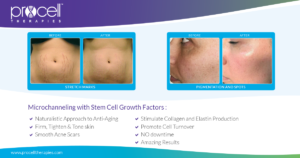 The treatment produces a clinically significant increase in the production of new collagen and elastin through the release of powerful peptides, growth factors and cytokines. Procell produces maximum stimulation, with minimal inflammation. This balanced approach to skin rejuvenation reduces recovery time to near zero, while maximizing results! The typical recovery involves just a day or so of mild redness, and any evidence that you’ve had “something done “can be covered with a quality mineral makeup within 90 minutes of treatment! You’ll experience an almost immediate improvement in skin tone, texture, laxity, fine lines and wrinkles. 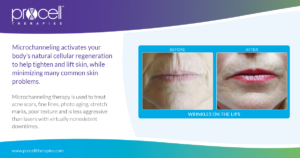 And you’ll see long term improvement that resists the aging process when you complete a series of treatments as recommended by our team. 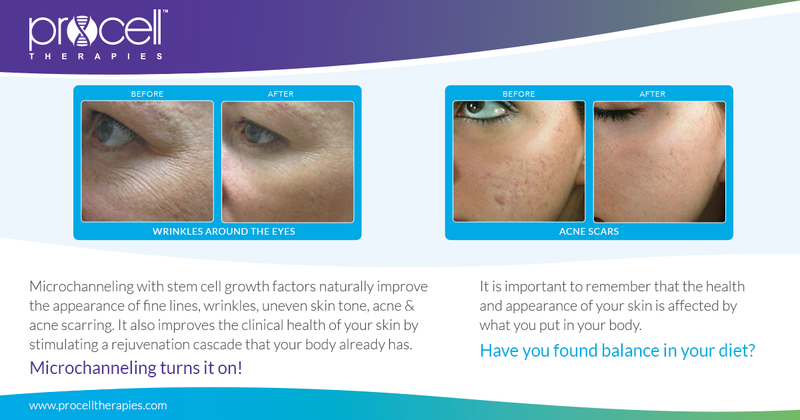 Visible improvement in aging skin, acne and other scarring, uneven or hyper-pigmented skin & overall tone and texture are visible after your first treatment with Procell. And with our expertise, we can show you how to make those results last! A series of 6 or more Procell treatments, about once a month can dramatically improve your skin’s firmness, smoothness, elasticity, hydration, sensitivity & tone. 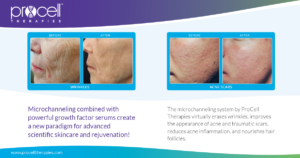 The Livra Microchannel Delivery Solution used during treatment, and the Livra Post Care Cellular Renewal Serum & Healing Accelerator all contain hyaluronic acid and a proprietary Stem Cytokine profile including peptides and growth factors that improve cellular communication during the skin rejuvenation cascade that occurs in the days and weeks after treatment. Visit with us for a consultation so we can help determine the best treatment plan to rejuvenate your skin with Procell MicroChanneling.